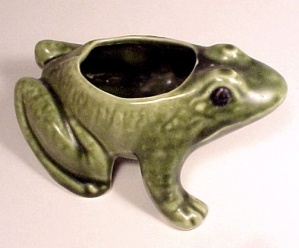 This handsome fellow has a soft matte glaze finish. Made in USA by Brush McCoy. Measures 5 3/4 inches L X 4 1/2 inches W X 2 3/4 inches H.
Gently Displayed. Nice Condition. Tiny Flea sized nick at base on one toe. Inside looks never used.